This book is up for sale on Amazon so often I honestly wonder how the author makes any money. And it's not like it's up for sale so that you'll have to buy the sequels at full price, no way. The sequels are up for sale as much as anything else. And I honestly hope this guy makes some money. 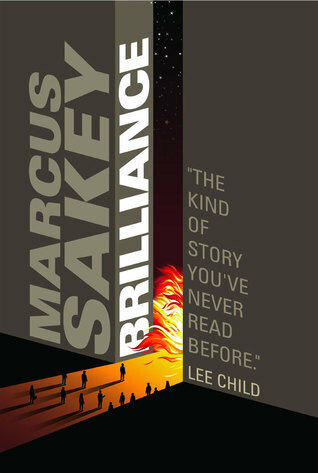 I had a great time with the first of the Brilliance saga. He's created a very real world, well, a real consequence of people turning out with extreme gifts that make them leaps and bounds above the average human. Take our protagonist, Nick Cooper, called "Cooper," who can read patterns so well he can even track fellow brilliants (the name of these gifted people) knowing nothing other than their movements to escape him. He can read lies, he can even read thoughts spelled out as plainly as if spoken. There are others, one in particular who have devastated the country because they can read the stock market. One in particular, John Smith, strolled into a diner and murdered everyone in it and Cooper wants nothing more than to see justice. One of the reasons I say this book is realistic for its subject matter is because Cooper actually belongs to a government group that tracks down his own kind. He believes because he's trying to keep the country together. His kind have shown their powers of destruction, but it's brilliant (get it) because is he right? Is this the way to achieve those goals? I thought this was a great concept that was also extremely well put together. That's often hard to do and often you get one without the other. I know he earns his pay, but I hope some day it grows larger ... at least as far as my calculations go. I always enjoy reading, even mediocre titles. But I have such high standards for excellence that it is rare these days that I find a new book that I can't help but to gush about to my friends and family. you way of describing things is very inspiring. Calamine carbonates mineral calcite family calamine, the main containing zinc carbonate. After digging, wash, dry, remove miscellaneous stone. This product traits of massive aggregates, irregular block, gray or pink. Surface powder, dull, uneven, porous, honeycomb-like. Light body, fragile. Odorless, taste astringent. Indications: Detoxification eyesight retreat, wet itch sore. For red eyes and sore throat, erythroderma,ulcer convergence, pus water dripping, wet sores, itchy skin. Irregular block, round or oblate, different sizes. Surface white, reddish or brown, uneven, porous like honeycomb. Body light loose powdery, brittle, white or red cross section, was granular and small pores, hygroscopic. Odorless, taste astringent. To light, quality loose, large block, color white or red are good. Shape, earthy, hull-like assembly. Pure white, often dyed gray, light yellow, light green or light brown. Transparent to translucent, shiny glass or dim earthy luster, crystal surface is sometimes pearl luster. Hardness 4.5-5, sexual crisp, fracture-like. The relative density of 4-4.5. 2. Was massive, earthy, porous to dense, hull-like, with fine fiber concentric ribbon structure. White to gray, purple, light purple. Earthy luster, was also silk luster. Hardness 4, the relative density of 3.5-3.8. Nice Post you have shared here.